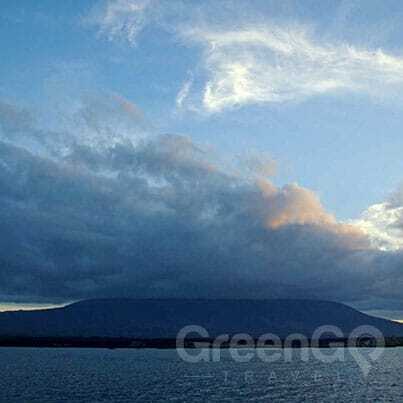 There are 21 volcanoes in the Galapagos Islands that emerge from the ocean and form the Archipelago. Of these, 13 volcanoes are active! Ever since Charles Darwin showed up here in 1835, there have been over 60 recorded eruptions on 6 of the volcanoes. Many people are fascinated by how such a delicate ecosystem – complete with its own micro climate – exists in such a volatile place! Historically, the critically endangered wildlife of the Galapagos has always been on the brink of destruction. The islands are formed from shield volcanoes and lava plateaus. Some of the islands are single volcanoes rising out of the ocean, others, like Isabela Island, are made up of several convergent volcanoes. These volcanoes all rise out of what’s called the Galapagos Platform – a large lava plateau that creates a shallow area around the islands between about 1,200 and 3,000 feet (360 to 900 m) below the ocean’s surface. The diameter of this plateau is roughly 170 miles (280 km). This platform is what’s known as a Hot Spot – a stationary hot plume from the Earth’s molten core melts through the crust and pumps magma upwards. As the tectonic plates move and shift, an archipelago of volcanic islands are created, similar to how Hawaii was formed. As new volcanoes are created, the older ones become extinct as they’re shifted away from the stationary plume. 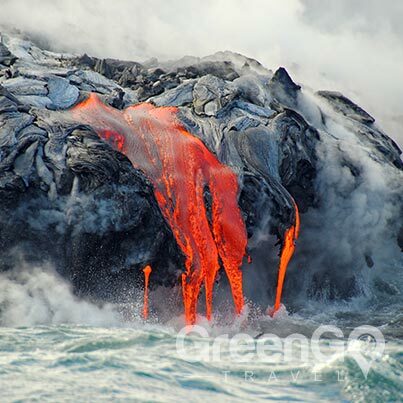 The volcanoes that form the Galapagos are considered to be new. They’re estimated to be between 700,000 and 4.2 million years old. I guess everything is relative. It’s hard to know exactly what’s been going on historically on these islands from a flora and fauna standpoint. It’s suspected that Fernandina Island had it’s own species of giant tortoise about 100 years ago, but there’s pretty well only animals that can swim that live there now. In more recent history, conservationists have had to step in at times to save local species from extinction. For example, this happened in 2008 with the Cerro Azul volcano. You can read more about that below. Along with 25,000 foot high (7.6 km) ash plumes, a curtain of lava was sprayed 1.2 miles (2 km) up. The name of the volcano translates to something like “Black Mountain Range”, and with this volcano’s scorchy past, it’s not hard to imagine why it earned the name. Fissure eruptions resulted in lava flowing 6 miles (10 kms) to the east, and almost 2 miles (3 kms) wide. Because of this eruption, a second fissure opened up further down the slope in June. Like many of these volcanoes in the Galapagos, Cerro Azul (Spanish for Blue Hill), has a very active past. This volcano erupted in 1932, 1940, 1943, 1949, 1951, 1959, 1968, 1979, and 1998 in addition to this eruption in 2008. In 1998, conservationists had to step in and rescue 11 tortoises by helicopter, and retrieved another 10 by hand to ensure that the species would survive. This was no easy task, since these tortoises can weigh up to 500 lbs (225 kg) and travel over 4 miles (7 km) inland. Apparently 7 of these critically endangered tortoises were killed by lava and resulting wildfires. 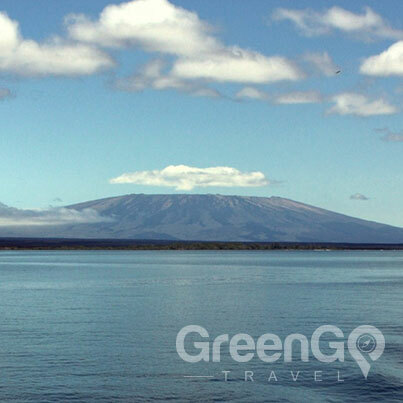 The Wolf volcano is huge – it stands 5,600 feet (1,700 meters) above sea level, and is the biggest of the Galapagos volcanoes. This eruption lasted about two months! It was placed at a magnitude 4 on the Volcanic Explosivity Index (VEI), which is classed as a large explosion – on par with Mount St Helens in 1980! The huge explosion sent ash up 50,000 feet (15 kms) into the sky, and lava flowed all the way down to the ocean. At first, conservationists were really worried about the population of the extremely rare pink iguanas, which are only found on the same island as the Wolf Volcano (Isabela Island), as well as the local population of yellow iguanas and giant tortoises. Thankfully, though, the lava flowed to the East, away from these critically endangered species. Steam and gas plumes rose 13,000 feet (4 kms) during this eruption, and lava flowed down the sides of this volcano. The explosions from this eruption lasted a few weeks. 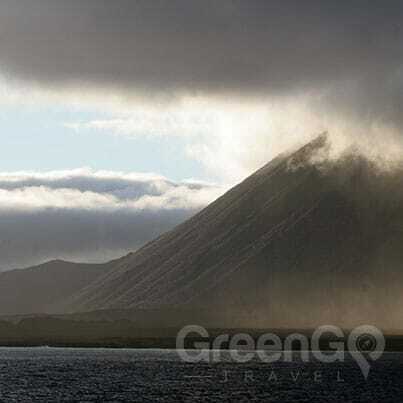 Many experts consider this to be the youngest and most active of the volcanoes in the Galapagos. Because of this constant activity, the volcano (which is basically a complete island sticking out of the ocean) doesn’t have much plant life and has a predominantly rocky surface. Despite this, Fernandina is an interesting island to explore. Punta Espinoza is an area where hundreds of marine iguanas gather in large groups on the volcanic rocks. There are also the famous flightless coromants, penguins, pelicans and sea lions that make for a really unique visit! This is nowhere near a complete list, just a few highlights. Really, the Galapagos Islands are the perfect place to see marine iguanas hanging out on the rocks with fresh lava spewing out the side of the volcano in the background. Unlike many natural disasters, volcanic eruptions are closely monitored and are predictable. Ecuador has an agency (Instituto Geofísico) that keeps a close eye on all of the volcanoes on both the mainland and the islands. You can see their site here where they give notice of any potential danger with the 84 different volcanoes that they’re aware of. Although it’s in Spanish, the main concerns are color coded near the top, which makes it fairly straightforward to interpret. Ultimately, though, you don’t need to worry about watching your own back. Any tours or cruises that are scheduled during dangerous periods will be either cancelled or rerouted so that everyone stays safe. Generally this would only consist of a particular excursion being affected, rather than the entire tour. Really, these powerful giants are something that make the Galapagos a truly unique place. The active volcanoes are constantly changing the landscape, destroying swaths of land to add another layer to the islands. Many tourists have been able to experience nature’s fireworks as these behemoths have sprayed molten rock from deep inside the earth. Nobody can tell for sure what the Galapagos islands will look like years from now. Will a volcano explode and wipe out all wildlife? Or will vegetation continue to claim the minerals expelled from the earth’s core? Time will tell. Looking to spot a specific volcano on your visit? Contact our local experts! they can guide you in the right direction with the cruise and program that suits your needs. Do I Need to Watch Out for Bugs in Galapagos?